MOSUL, Iraq, March 19 (Xinhua) -- Iraqi government forces battling Islamic State (IS) militants retook control of more areas in the old city center of western Mosul, while an international airstrike on IS positions killed six leaders of the extremist group in the city, the Iraqi military said on Sunday. The commandos of the Counter-Terrorism Service (CTS) fought heavy clashes against IS militants during the day and freed the neighborhood of Nablus in west of the old city center and raised the Iraqi flags over some of its buildings, Abdul-Amir Yarallah from the Joint Operations Command (JOC) said in a statement. The elite CTS special forces are also fighting IS militants in several nearby neighborhoods, as they have been advancing closer to the western edge of Mosul's densely populated old city center, where hundreds of thousands of civilians are believed to still be trapped under IS rule. Meanwhile, the progress by the federal police and Rapid Response brigades, the elite Interior Ministry units, was slowed by bad weather and fierce resistance of IS militants in the newly-freed Bab al-Toub neighborhood and adjacent areas. 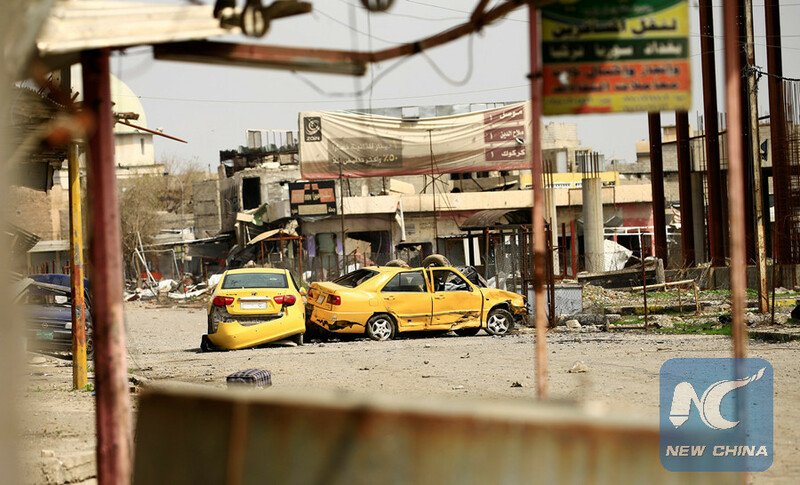 Also in the day, the U.S.-led international coalition conducted an airstrike and killed six IS leaders in Souq al-Shaareen area in the IS-held city center in western Mosul, locally known as the right bank of the Tigris River, which bisects Mosul, the JOC statement said. Intelligence reports said the six killed IS leaders are Abdul Kreem al-Roosy (Russian), Salih al-Ahmed (French of Syrian origin), Abu Duaa al-Magribi (Moroccan), Yousif Uwni (Turkish), Abdulla Humoud (Moroccan) and Milad Seiro (British of Algerian origin), the statement added. Near Mosul, the army's 9th armored Division recaptured al-Mulawtha area and a village in north of the town of Badush, some 10 km northwest of Mosul, after defeating IS militants, leaving many of them killed, according to the statement. Iraqi Prime Minister Haider al-Abadi, who is also the commander-in-chief of the armed forces, announced the start of an offensive on February 19 to drive extremist militants out of the western side of Mosul.